WELCOME TO YOUR EXCLUSIVE VTGETAWAY ONLINE ACTIVITY GUIDE ! welcome to The Vt Getaway family! This documentation will “guide” you through your Exclusive activity Guide. Access the guide from the menu under ATTRACTION & ACTIVITIES > VTGETAWAY EXCLUSIVE ACTIVITY GUIDE. You will then be redirected to the login page. Which will look like this. From the login link, you will be redirected to the login page. Enter your login details. You should be redirected to the activity areas. If you hover your computer mouse on any of the pictures, you shall see the name and a little detail about that area. click on the area and you will then be redirected to the activities page. 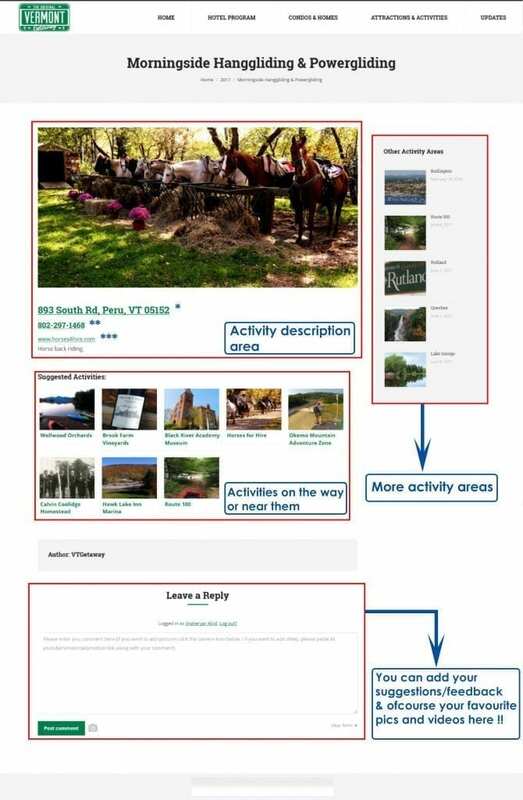 By clicking on any of the activity area from the activity areas page, you shall be redirected to the activities page. (*) Click the addresses to get the Google Map directions. (**) Click the number to make a call. (***) Here is a link to this activity website. Other activities in that area.